The people of Clairton are a little worried about Rom, especially Brandy and Steve. Soon enough though, he returns and lets them know what had happened to him. While ruminating outside and thinking about his home planet of Galador, Rom is suddenly confronted by Starshine and Terminator, two of his fellow Spaceknights. But something does not feel right because Terminator is supposed to be dead and if the Dire Wraiths were right, Starshine is as well. The Spaceknights attack him and he cannot understand why and also does not wish to raise a hand against them, but when they attack Brandy and she deduces that they cannot be who they claim, the scheme is uncovered and the Wraiths revealed. 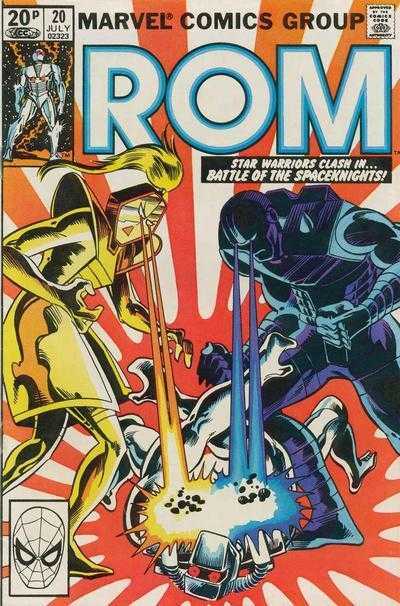 Sal Buscema and Bill Mantlo give us yet another great tale of Rom, newly returned from Limbo to face the ever-increasing attacks by the Wraiths to rid the Spaceknight from the Earth. We also get introduced to a new villain by the name of Mentus who looks like he will be giving Rom a hard time in the near future. On top of the normal Wraith threat, this could be the straw that breaks the cyborg’s back. As an added bonus, we also get treated to a secondary story, one which sees Terminator go on trial for killing an innocent, something that goes against everything the Spaceknights stand for. It is an emotional tale that sees Rom plead for his friend’s life and then sees that same friend accept his fate and ask for death. Rom is a fantastic book that just seems to get better and better with every passing issue and it sees Mantlo and Buscema on the top of their game. Grey Matter – The Weekly Roundup!